Sakura Days Japan Fair gave visitors a chance to experience Japan with hands-on workshops (calligraphy, origami, haiku) and amazing performances. What a fabulous week-end! Several tree talks and walks were lead by Van Dusen garden volunteers. There were lots of cherry trees to talk about including the beautiful tai-haku (great white cherry). 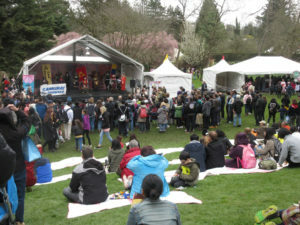 The winning haiku from the Vancouver Cherry Blossom Festival Haiku Invitational 2017 were displayed in the garden for everyone to read and enjoy. At the Haiku House, you could attend a workshop, try your hand at writing a haiku, make a button, or take a guided walk to the haiku rock. The food was a major draw. Outdoor demonstrations included the forging of Japanese knives by knifewear. If you preferred to be inside, you could visit the vendors and pick up a petal mat or guide to Ornamental Cherries in Vancouver at the VCBF table. People gathered on the hill, sitting on petal mats, to watch the show on the cherry stage. During her calligraphy demo,Kisyuu disappeared behind the canvas to paint the back of the canvas while the picture was slowly revealed to the audience at the front. Hojo Hand-Crafted Samurai Armor Corps grabbed visitors’ attention as they walked to the stage to perform an elaborate play in full costumes. Two performers from Japan, Keita Kanazashi on the Japanese Drum and Kohei Honda on the shamisen, drew a big crowd with their amazing energy. Outdoor performances kept us dancing until 7 pm. The event ended with lantern procession from the Cherry Stage to the Visitor Centre. Sakura Days Japan Fair is two-day festival organized by the Japan Fair Association of Vancouver as part of the Vancouver Cherry Blossom Festival. It took place at the Van Dusen Botanical Garden. People who attended Saturday were able to walk over to Queen Elizabeth park to see the Sakura Illuminations.